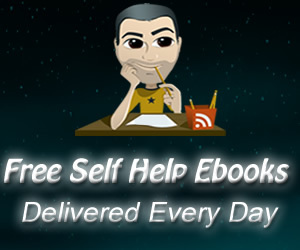 My good friend and fellow writer, Steven Aitchison has started a new site giving away Free Self Help ebooks, delivered to your inbox every single day of the year. Steven, was so tired of his readers having to sign up for hundreds of offers just to get free ebooks, so he took matters into his own hands and decided to turn everything on it’s head and offer one sign up for hundreds of ebooks. He sends you a FREE ebook every single day, packed with great information. I think this is an amazing offer and hope you all enjoy it like I do.